Who is Ant-Man anyway? This bear costume guy didn’t bother figuring it out. What you’ll find in this post is information cribbed from Wikipedia, Marvel, and YouTube users — we are here to collect and curate resources for you in one convenient place. You won’t find our opinions anywhere. And remember, this resource is for people that aren’t comic readers, there are plenty of places to get in-depth information about Ant-Man. We’ll give you an intro, a list of Ant-Man’s powers (Marvel Comics Database) his origin story (written and on video via IGN), recommended reading (MCD) and comments about Ant-Man from comic readers (via Reddit). Oh, this is important, we’ll be talking about the Mainstream Marvel Universe Ant-Man, Scott Lang, Earth-616. Don’t worry about all of that if you don’t know what it means. *Note. Ant-Man relies on some kooky comic book science, so we’ll provide TL;DR descriptions of his powers. You can learn more here if you’re interested. Able to reduce himself to the size of an ant, approximately one-half inch in height. Can will himself and other objects to reduce in size or enlarge. The original mass means a punch delivered by the half-inch high Ant-Man would feel like the blow of a normal-sized man. Possesses the normal human strength of a man of his age, stature, and build who engaged in moderate regular exercise. In his smaller size, his strength is equal to an ant’s. Wears a cybernetic helmet permitting him rudimentary communication and control of insects. His helmet also contains sound amplification equipment that also shifts the frequency of his voice so that he can be heard by normal-sized humans despite his diminutive size, as well as providing its oxygen supply. 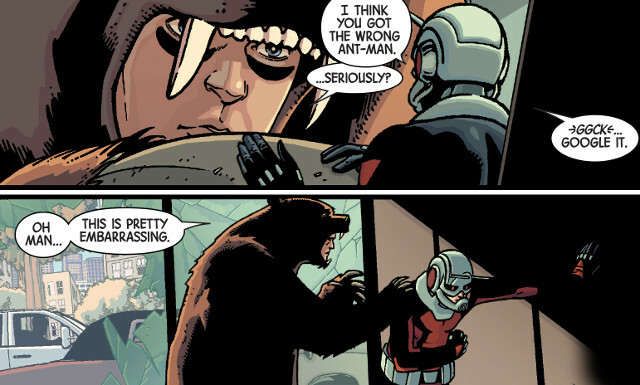 Ant-Man is one of the funnier characters in the Marvel Universe. Scott Lang was a down-on-his-luck electronics expert, who turned to burglary as a means of supporting his family. Scott proved to be a poor criminal and is arrested during a botched robbery. He is sent to prison but received an early parole for good behavior. After his release from jail, he was hired by Stark International to resume his work in electronics. Although Scott’s life seemed to be improving, he was devastated to learn that his daughter Cassie is diagnosed with a serious heart condition. Scott desperately wanted to save Cassie’s life and sought the aid of the brilliant micro-surgeon Dr. Erica Sondheim. Unfortunately, Dr. Sondheim was being held prisoner by the mutated villain Darren Cross. To rescue Sondheim, Scott stole Hank Pym‘s old Ant-Man equipment. Taking the Ant-Man mantle, Scott used his newfound power to defeat Cross and save the doctor. Scott was prepared to return to prison for his crimes, but Hank Pym was impressed by his heroics and saw Scott’s potential as a hero. Dr. Pym allowed Scott to continue using the Ant-Man equipment and identity. More importantly (at least to Scott), Dr. Sondheim was able to successfully treat Cassie’s heart condition. Here’s an origins video for Ant-Man from the good people over at IGN. Note: So, the Ant-Man Paul Rudd is playing in the movie is Scott Lang, the long-standing Ant-Man was Hank Pym (played by Michael Douglas). We’re going to give you Scott Lang stories to read. Here are the recommended story arcs from the Marvel Comic Database. Marvel Premiere #47 and #48. 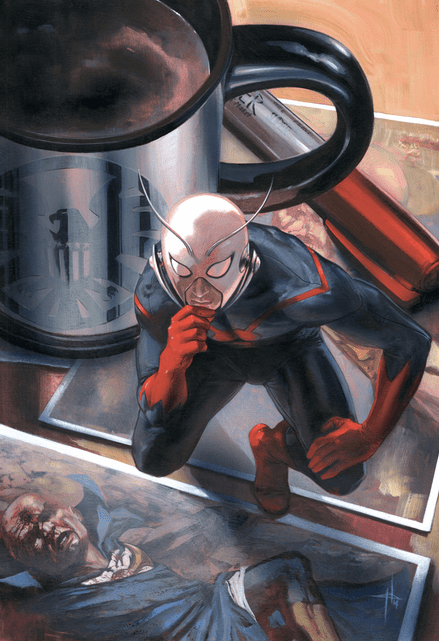 These issues introduce Scott Lang, Pym’s successor as Ant-Man and take the character in a new direction. Ant-Man Vol 2. The adventures of Scott Lang, as he tries to balance being a superhero with being a father. It’s important to note that focusing on Scott Lang instead of Hank Pym was a curious one to comic readers. Hank Pym’s history of domestic abuse didn’t help. If you’re interested at all in that conversation, we’ve pulled some quotes from Redditors on what they think about that choice. The original director thought a criminal turning into a superhero was a better hook than scientist turned hero. MCU merely borrows certain story beats from the comics, not entire storylines ad verbatim from the comics. Personally, Scott is a better story. I understand the sentiment of wanting Pym, but the guy is a huge mess in damn near every storyline. The amount of domestic abuse jokes/begging for it to happen would be unbearably annoying. TagsAnt-Man Hank Pym Just the Facts about Ant-Man Marvel Ant-Man marvel cinematic universe Paul Rudd Scott Lang Who is Ant-Man?